If you’ve never met an autism parent before, one thing you need to know about them is this: when they see a need, they work to fill the void. Two moms filling the void in their neighborhood are Alysia Butler and Tina Perriello. Recently, they created SenseAbility Gym - a non profit parent led sensory gym for special needs kids. I've been following Alysia Butler's blog - Try Defying Gravity - every since I started blogging two years. And I had the pleasure of meeting her while at BlogHer12. Anyway...I had the opportunity to pick her brain regarding her latest venture. AW: You wrote in that starting SenseAbility was something you had to do? Why? AB: There were two reasons why we felt that we really needed to do this. First was selfish. I have three boys, my youngest two are both on the autism spectrum. It's my middle guy who needs the sensory integration supports. In school, he has a "sensory diet" built into his day - meaning he takes breaks from the classroom when it becomes too loud or overstimulating for him, he'll jump on a trampoline when he's having a hard time sitting, he has a weighted lap pad that he actually sits *on* to help him be comfortable at circle time, and around his chair at his desk he has Therabands to exercise his legs while he does his work. All of these activities help him in the classroom. At home, we don't have the space or the money to have all the equipment that he uses at school to help him calm his body. When we attended some open sensory gym times at local OT clinics, I could see how much it helped him feel more comfortable in his own skin. And how much happier he was. I wanted to have that smile last forever. By opening our own gym, I could do that. Stemming from that, at those open sensory gyms we saw how happy all the other kids there were as well. We watched the parents interact with their children in such a warm and accepting way. No one there cared if another child was melting down, or spinning, or making eye contact. We were all there together. There were no stares. Only support. Again, we knew we needed something like that in our area. Even to get to an OT clinic is a far drive. This was something our community was missing and we knew we had to fill that void. AW: What do you hope SenseAbility will do for your community? AB: We really believe that SenseAbility Gym can become an area resource and meeting place for families with special needs children. Our goal is to create a community where its members feel welcomed and supported, where parents and children can go to socialize with other families who share similar challenges. The environment will be one that recognizes that all special needs children are different and that all learning styles, personalities, and abilities are welcome. Our area is already incredibly welcoming and inclusive. 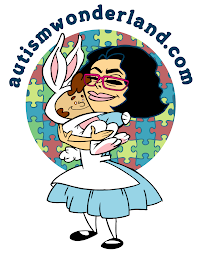 We have very strong autism resource centers and foundations that support families like mine. This will be another piece of that support system. AW: Starting a non-profit is no easy task, especially when resources are limited. Any tips on how to make the process easier? AB: Starting a non-profit is hard, very hard. There were definitely moments along the way when we questioned why we were doing it this way. But we knew we couldn't do this as a for-profit venture because of the very nature of our beliefs and mission. Our goal is to reach as many families as we can who can't afford the type of equipment we will have in the gym. Our best advice is to find people to help you. My late father used to tell me all the time to "use your resources". He would say that it's called networking, not using. He would remind me that I would help someone else if they asked, so why shouldn't I ask for their help? A lot of times, we don't want to ask someone to help us because we don't want them to feel like we're using them. But people will say no if they don't want to help. No one said no to us. We relied on family, friends and the kindness of strangers to help us. We had people review our materials to make sure they were in order. Neighbors took their personal time out of their evenings to walk us through the steps. We connected with friends who connected with friends. When you believe in your project, people will want to come help you and support you. Most importantly, though, is to do your homework. Understand your state's rules and laws around what forms you need to file and when. Make sure you aren't breaking any laws that you didn't know existed. Have a lawyer review your materials a few times. And breathe when you take that leap of faith that it will all work out. Because in time, it will. Alysia's blog is called Try Defying Gravity after the song in the Broadway musical Wicked. With moms like Alysia and Tina there is no try - they are defying gravity. To read more about their plans, click HERE. To make their dream a reality, click HERE.